This report came from Jayne Hogan, NSW Australia. 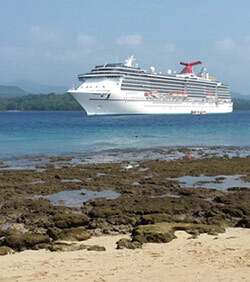 I recently returned from a 12 day cruise in the Pacific Islands on the Carnival Spirit and can thoroughly recommend them for anyone with celiacs. It was our first cruise and I was a bit worried how it would work out. But in the 12 days I had more variety and more delicious meals than I've had in the past 12 years of being celiac! On the first visit to the dining room I explained I needed gluten free meals. I was assigned one specific staff member who then bought me out the menu for the next days meals and reassured me that the chef would be happy to make any meal I wanted. Each night at dinner I chose my meals for the next day, and the food was just wonderful! My favourite was the sweet potato soup, the vegetable parmigiana and the creme brulee. I really can't praise the quality of the food enough - it made a real difference to our holiday as we could just relax and eat without worrying. Most days we ate in the dining room. Each night as we checked in I told them I had a gluten free diet and the printed of a slip of paper for my waiter with my meals on it. I never once had a problem or a mix up. Some days we ate upstairs in the general self serve section as on days the ship is in port the dining room is closed for lunch. There was gluten free toast and muffins available at breakfast and I always took a muffin with me each morning for later in the day. There was plenty of fresh fruit, fresh salads and vegetables for me to choose from. As a result of our experience on Carnival Spirit we have decided that we will be cruising in future for our holidays, it was just so nice to be able to eat with my DH and not have to worry about meals for whole trip.